When I started to test the Evo Mini I was curious as to whether it would be suitable for different types of public transport. To be perfectly honest I dont use public transport often. I find it too much hassle with two small children but I do know that it is essential for lots of parents. In the past week I've used the Evo Mini on both a train and a bus. Last Thursday we travelled to Birmingham via Virgin Trains. After asking for directions to where i could get on with a pushchair I was shown to a carriage with a tiny corridor next to a toilet. As soon as i saw the space i thought there was no way I could fit there with a pushchair with room for people to get past. Thankfully we fitted in with enough room for other passengers to get past without having to keep moving and manouevering the pushchair into different positions which i've had to do on numerous occassions with some past pushchairs. The picture below shows Zach in the pushchair with plenty of room to the side of him. Unfortunately I couldn't get into the carriage to see if there was room to store it folded up. Yesterday, as the sun was shining I decided to stick Zach in our Boba 3G baby carrier and Gracie in the Mini Evo to take the bus into town. I'm ashamed to say it was the first time I've took both kids out on my own anywhere that wasn't in walking distance. Gracie is a great walker but gets tired walking long distances still. 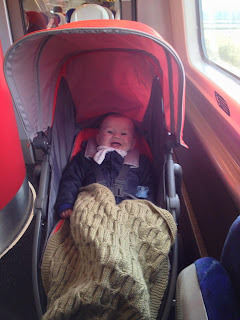 We have a double pushchair but they are just not practical for public transport. I was so glad I decided to test this out on the bus as it slotted easily into the smallest pushchair space with room for me to sit next to it. The brakes worked well enough for it to stay still when the bus came to sudden stops and it was easy to get on and off the bus. It was nice and light which was very helpful when pushing a heavy toddler whilst having a baby strapped to me. What was best was once we were in town I could get Gracie out so she could walk, put Zach in the pushchair and had more than enough room to store the baby carrier and a few bags of shopping in the basket. We have now had the pushchair almost two weeks and are yet to find anything to put us off. I think the only negative I have is that it isn't parent facing but when buying the pushchair you know that it isn't parent facing as I love the interaction with a parent facing pushchair. If you want to keep up to date with how we are getting on don't forget to follow us on Facebook, Twitter or Pinterest. You can find links to our pages by clicking our follow buttons on the right hand side of this page. I love your post and it looks like Zach enjoyed his trip on the train in the pushchair! I got my Graco pushchair from eBay and didn't really know what to expect from it, it was on offer and had some good reviews so I tried it out and I couldn't be happier with it! Its perfect for my child and light enough for me to fold up and store easily. I agree with Kterine Avns. Any item that can be better handle with the baby are always craved.